Mya’s reign of triumph is over! Now Helen reigns supreme! But can she hold on to her crown? First she’ll have to survive the battle round! In this episode, our contestants square up to questions about the past continuous! Can Helen hold on? Will you be able to answer our questions? Will Will ever play fair? Watch and see! Hello and welcome to the Grammar Gameshow! I’m your host, Will! – but I’ll change for person and time! And of course, let’s not forget Leslie, our all-knowing voice in the sky. Welcome back Helen! Ok. Let’s get going, and don’t forget you can play along at home too. Our first round is a battle round. 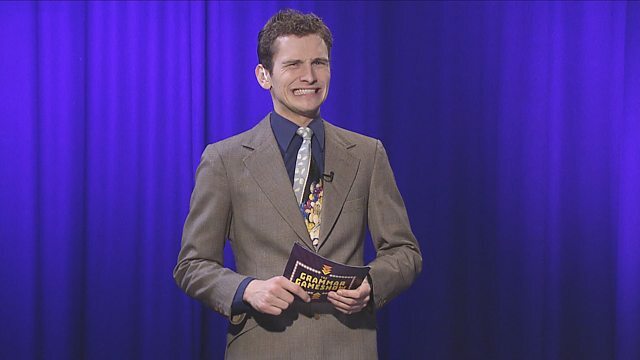 Contestants ask each other questions about the past continuous until one of them makes a mistake. Helen do you want to start? Oh! Right! What is the formula for the past continuous? ‘Was’ or ‘were’ + ‘VerbING’. Ha ha! What do we use the past continuous for? Actions which are in progress at a past time. Ha ha - yes! Give me an example. I was eating dinner at 6pm last night. Ha ha! Do we use the past continuous with state verbs? No, not usually. Ha ha – yes! Do we usually use the past continuous with repeated actions? Oh! That was vicious! Well played, but Helen, you made a mistake there. Leslie? Mostly right! The past continuous is used to describe actions that were in progress at a past time. It is constructed with ‘was’ or ‘were’ and ‘verbING’ - and, being continuous, it does not usually use state verbs. However, it does not usually describe repeated actions or habits either. Sorry Helen, that’s the past simple. Sorry Helen. 20 points to Greg. Let’s move on to our next round. Which one of these sentences is incorrect and why? a) I was walking when I tripped and fell. b) I was walking while I tripped and fell. c) When I was walking, I tripped and fell. d) While I was walking, I tripped and fell. Trick question! They are all correct. No, no. B is wrong – we don’t use ‘while’ for quick actions. Ha ha! Wow. You two are really getting into it! Leslie? We often use the past continuous and past simple together to describe a longer action that is interrupted by a short one. These actions are connected with time words like ‘when’ and ‘while’. However, we do not usually use ‘while’ in front of the short action. Well done Helen. Well done Helen. 20 points for you! This is exciting. It’s neck and neck! It’s time for our final question. True or false: The past continuous can make you sound more polite. It is true! Can you explain how? Using the past continuous makes things more polite because it seems temporary and so more casual. Yep. Using the past continuous can make sentences seem more polite by distancing them from the present – this makes them sound more tentative and less assertive. More gentle. For example – ‘I was hoping you could lend me money’ is more polite than ‘I hope you can lend me money’. Well, this is tricky. Helen you said it was true and Greg you explained it. Who do I give the points to? You should give it to me! No you didn’t. I got it right. You should give it to me! I know! Wasn’t that easier? And that brings us to the end of today’s Grammar Gameshow. And the winner is…. Me! Well done! Thank you! What have I won? The past continuous is formed using 'was' or 'were' + verbING. It is used to describe actions which were in progress and unfinished at a specific past time. It is a continuous tense, so we do not usually use it with state verbs, such as 'need', 'want' or 'know' and we do not use it to talk about repeated past actions or past habits - that's the past simple tense. I was sitting at home last night. Were you cooking when they arrived home? She wasn't sleeping, she was watching TV. The past continuous and past simple are often used to talk about how two past actions happened together, either in parallel or one longer action, usually in the past continuous, that is interrupted by a quicker one, usually in the past simple. To join the two actions, time words such as 'when' and 'while' are used. Many combinations are possible, but we do not put 'while' in front of the shorter action. While I was eating, she called me on my mobile. When I arrived, everyone was laughing and dancing. He was walking when he tripped and fell. We can use the past continuous to make sentences and requests seem more polite. This is because they sound less definite, more temporary and more gentle. When using the past continuous in this way, it is possible to use state verbs. I was hoping that I could borrow the car? Sorry to interrupt. I was just needing to borrow a pen. The past continuous is formed using 'was' or 'were' + verbING. It is used to describe actions which were in progress and unfinished at a specific past time, or can be used to talk about two actions together (the interrupted past). But, we do not use it to talk about repeated past actions or past habits - that's the past simple tense. Which of these is an incorrect use of the past continuous? We can combine the past continuous and the past simple together using time words like 'when' and 'while', but we don't usually use while for the quicker action. Which one of these sentences combining the past continuous and the past simple is incorrect? We do not usually use state verbs with the past continuous...but does that mean we NEVER use state verbs? True or false: You can NEVER use a state verb with the past continuous.